The most important of Ryszard Kierzek projects concerned: (a) chemical synthesis of nucleosides, nucleotides, plus natural and modified oligonucleotides; (b) researches into the thermodynamics of natural and modified RNAs; (c) investigations of nonenzymatic self-cleavage of oligoribonucleotides; (d) studies of various aspects of the structural biology and chemistry of RNA; (e) developing a new type of microarrays (isoenergetic microarrays) and their application to the study of the structure and interactions of RNA; (f) the application of short modified oligonucleotides to the selective cleavage of target pathogenic RNAs with the aim of inhibiting their biological activity. Some of the most important scientific achievements are presented in details below. Ryszard Kierzek has been working on the chemical synthesis of natural and modified nucleosides, nucleotides and oligonucleotides since 1973. The most significant achievements on this subjects are: developing methods for the selective deprotection of 2-cyanoethyl and 2,2,2-trichloroethyl phosphorous protecting groups; contribution to the first chemical synthesis of modified heptanucleotide corresponding to tRNAPhe anticodon loop; contribution in developing methods of the chemical synthesis of DNA oligonucleotides using the block triester approach on solid support (including chemical synthesis of large fragments of interferon and gonadotripin genes); developing methods for the chemical synthesis of oligoribonucleotides with 2'-O-tetrahydropyranyl protecting groups on solid support using the phosphoramidite approach; developing methods for the chemical synthesis of branched RNA and RNA containing additional 2'-O-phosphates; performing chemical synthesis of variously modified oligonucleotides (over 30 different modifications); chemical synthesis of oligonucleotides containing LNA-2,6-diaminopurine riboside and LNA-2-thiouridine. 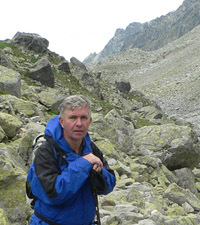 Towards a better understanding of the thermodynamic properties of RNA, Ryszard Kierzek main contributions have been: the determination of the thermodynamic parameters for RNA duplex formation; the determination of the influence of RNA structural motifs (e.g. bulges, internal loops, hairpins, 5'- and 3'-dangling ends, single mismatches, terminal mismatches, noncanonical base pairs (e.g. G-U, G-A)) on the thermodynamics of RNA molecules; evaluation of the influence of over 40 natural and artificially modified nucleotides on the thermodynamic stability of RNA duplexes; determination of the thermodynamic parameters of 2'-O-methylRNA/RNA and chimeric LNA-2'-O-methylRNA/RNA duplex formation. The thermodynamics of RNA duplex stability and the structural motifs listed above have been parameterized and are almost universally used in the computational prediction of RNA secondary structure (e.g. by such programs as Mfold, RNAstructure, and the Vienna RNA package). The development and application of isoenergetic microarrays was initiated in the RNA Chemistry group around 2004. The motivation behind this project is to apply high throughput methods (microarrays) to the analysis of RNA structure via profiling the probe binding accessibility of a structured RNA. The novelty of this approach is two-fold: firstly, this is the first application of microarray technology to the study of the structure and interactions of RNA; secondly, this is the first use of socalled "isoenergetic" microarrays. The goal in developing isoenergetic microarrays is to make target binding independent of sequence, but highly selective to structure. This was accomplished by incorporating several base (diaminopurine riboside) and backbone (LNA, 2'-O-methyl) modifications into oligonucleotide probes, whose effects are such that the thermodynamic stability of duplex formation is enhanced and as uniform as possible across the probe library. The design of the modified microarray probes was preceded by extensive studies of the thermodynamic stability of 2'-O-methylRNA/RNA and chimeric LNA-2'-O-methylRNA/RNA duplexes. So far, this method of probing of RNA structure by microarray has been successfully applied towards elucidating the secondary structure of five retrotransposon RNAs (ca 330 nucleotides each). Recently, microarray mapping was successfully used to study RNA/protein interactions, to study RNA conformational dynamic and investigate the regulatory function of RNA. RNA microarrays as new tools of structural and functional genomic to studies the structure and interactions of native RNA, 15.10.2005–14.10.2008. Supported by Ministry of Sciences and Higher Education. Modified oligonucleotides as allele specific therapeutic and regulators of pathogenic human genes, 21.12.2007-18.12.2010. Supported by Ministry of Sciences and Higher Education.